I .Ial H.J.igrI rni II'l "I It r Kr .n . IA. IJ'" I 'Lu I.
Em li, men tax and conribuion ..
E siat and gf r axc ... .
[ N ri l rpn .. ... ... .. ... .
Drpanmrn r f Defr ... .. .
Intr on the L puhl., . Set tfooites on pae 1. Deposits by States ............. ................................ .
Other........ ........ ............ ............... .
See footnotes on page 3. ....... .. .... ... .... ........... .2,132 ............. 2,132 .............. ..
r Ir I I I ,. I .. 4I 1, ..
F tal InTirriAI'trmal l*ri. rtn-l*! l'r '. Rural housing insurance fund ......... ... .......... .......... .
O ther........................... ......................... ....... .
National Forest system .................... ......... .............. .
-ul-f u! hK r ,(Ilu . Department of the Army .................. ....................... ..
Other................. ............ .... ...................... ...... . Flood control ............................ .... ................... . Proprietary receipts from the public .............................. .
Impact aid ........... ..................... ................. ..
kr.rupl.. I *,rl,, I r r '' I iKr r h.lI Ii *, r r.... I ,a..
d aJ s la t Itt i r. J .lJi* d .
I. raten p ,,, ; ,, n .*, ,,4 .nt. NatFal I r le s d t ir :trrr *II I . Other research institutes ....... ..... .................... ..
;He.I. ,-1'..r, a ,riI ,...a|l e r,, ''i.Ij H ir, . r ,. I .l A, *- I ii ] ,. \I* rl d e l a \ IC CI r. .
,..lm, I kr.Ipi. I ,aljl a 'n Hre rl . a t. *- ;j I..
Interest on refunds of taxes ............................... .... .
Administration account ................... ................. ..
Inral J' IIj rI J . 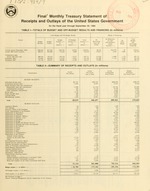 Operating expenses .......... ............ ... .. ... .. ... ..
Other .......... ... ... ......... .. ... .... .. ..
Operating-differential subsidies ......... ... ........ ....... .
Other .............................. ....... .......... ....... .
Payments to synthetic fuels corporation ............ ...... .... ..
Other ......................................... ...... ..... ..
Bureau of Engraving and Printing .................. .................. .
Other ...................... .... ... ... ....... ................... .
AI's f ,' ,*, r i r, .. .,. 1 .n l i1'rrr '< 'l, . )'rfj'*.r*al t Irt (c [" i, ,'' r m -.,." KH .,.i ,-J ik.r r' "
Other ................. ........ ..... .. .... ........ .........,. Other .................. ............. ........ ..... ... .
General operating expenses............... ........................... ..
Veterans special life ............................................... ..
S ... .. .. .
|I ,r, .. ,s *, ,, ,* |l . r (* 2 2 Ih 1 *. 2 2. . I ndlrlip ) "l r ri'! Sc _r ,. n "a "
Budget receipts ................ ....................... ..
ToAl fepl s+ u tes ..
fT ia ( seI .st4 hetJ '.r 1 . Aiati of C pr I dreawng A" ts. stf az ouus babist unhp (.i. ludei i hekts rtt i 1 4' 7 ..1......^ ^ .. I, ren a iota pa,,te t i' ""
hlar Idepoa s wIh ,the IMF "
Il i rna 'in g lj i l I I' . * .'. l b I in Jl *1 1. ''. Ierr ..r.*'l, r' '' I jr L.
I ..rnT .J. i ir J L .c . "a' ..-.I 1 .. ". " FJr. '1r I .ra .. ar l .. c r a . |rJ ,a]' tl '' p; 4 J.nv....a' "' ..
lIi Trtcen rl P ', At i n. ur.i j ij 4 i a . .kret '. 1 |. lljr fl HI rr. jrt..s r.I ..
jril .J.Il'pfnl ,naO4if r fjnid 4* *1 .
tuWJ t VT [ AuiilrlitL . r -, I "n N --. .tlter k' g rt. ,J1 l, '. .. ..
TBene< balle Ap thor ts *. l 1 ka. .4 i ...,j,,. n l ", ,"
Total agency securities ................... .............. ............ .
Total Federal funds ......... ...................... ...... ..
United States Tax Court .................................. ....... ..
'r-le -aP 1 -. -, HJ -. 1 *'..H; . * H. J 2* .' f '. 'if a' i.&. L .
Lcparlnwint . *r I % .a..
L Drpa irm rni *i E[i *jrii| . :lari c.
Envirol nmernt Pro lw.in Acfr. IftB rel l .. a .J . ;il" i Mh, i 1 "
S d *. * *- J ." Q*. funds transferred to trust funds for general revenue sharing. Enql'. * rner. diP, a r- a .J ,...i r.. I nrrpI +., .. e' s* ,'sc. 'i* ,r.. I r il1 TI 4. I. M C il l .
V triris btnchis and wrem .